The Golden Schools Foundation (GSF) has a vision to provide the students of Golden articulation schools with an educational environment where they will thrive and reach maximum potential. As an independent non-profit, we will raise and distribute funds in a responsible and ethical manner in order to foster excellence in educational opportunities. We will act as a partner with school administration, PTAs, parents, governmental agencies and businesses to encourage a cohesive approach to education where every member of the community is invested in our schools. 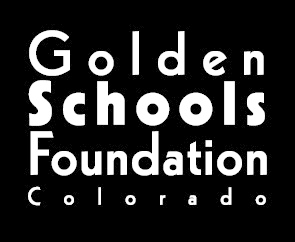 GSF is a volunteer run 501(c)(3) formed by concerned parents and citizens of the Golden, Colorado community in 2010. This group came together to help encourage a high level of performance and accountability at Golden’s neighborhood articulation schools – Kyffin, Mitchell, Shelton, Ralston and Welchester Elementary Schools, Bell Middle School and Golden High School. As an independent non-profit, we will raise and distribute funds in a responsible and ethical manner in order to foster excellence in educational opportunities. Our mission is to ensure Golden neighborhood articulation schools offer our children an outstanding education. We work in partnership with Golden schools, public education stakeholders and our community to promote improvements in student achievements and teaching excellence through collaboration, innovation and strategic investment. The Golden Gallop is our biggest annual fundraiser which allows us to sustain our five key programs: Enrichment Grants, Teaching Excellence, Teacher Recognition Awards, Summer Academic Intervention Camps, and College Scholarships. Without the generous support of our community and avid runners, the work of GSF would not be possible.